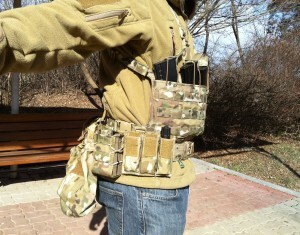 We rolled out an AK chest rig with Multicam webbing. 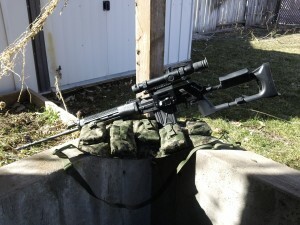 A customer sent us a few pics of his Multicam rig. 007 only wishes he had a white camo set up like this for his Austrian Alps MI6 superspy activities. A customer of ours requested a BCS White Plate carrier molle with shoulder and waist pads. At first, we were hesitent to take on building one of our carriers in white but decided it would be a great learning experience to source all the materials in white. 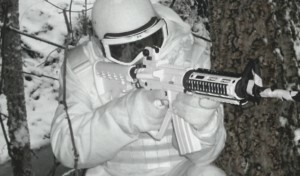 We now have the ability to do most of our tactical gear in white by request. The White Plate carrier goes well with his other winter warrior kit . He is definitely ready for any fighting that might happen when the snow starts hitting the ground or if he gets an assignment to the pole regions. One of our customers send us a pic of his BALCS LBAV carriers in A-TACS FG. He is waiting for the snow to clear to get us some action pics. We should see something by June time frame that's when Spring starts in Finland. The BALCS low profile LBAV carriers are available in Multicam, A-TACS AU, A-TACS FG, Coyote, Khaki, Olive Drab, Ranger Green and Black. This is by far one of the best low profile BALCS carriers on the market. We have received multiple request about our unique AK Chest rig pull-forward lat strap design. 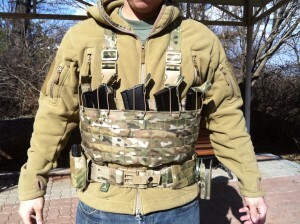 The pull-forward design allows the operator to adjust the AK chest rig on the fly. Other AK chest rigs require you to remove the rig and undo multiple buckles and make multiple adjustments. This can become a real pain especially if you are in a climate that has dramatic weather extremes where you are continuously layering or down layering clothing. As well if you are in an AO that has extreme threat level changes that requires body armor or concealment. Our AK chest rig line is designed to give the civilian rifleman/armed citizen the optimum rig to carry AK mags in rural or urban unsupported operations. The elastic bungee/over sized pull tabs provide for excellent mag retention and mag access. There is no rattle rattle because the mags are in individual pockets.Three rows of molle provide plenty of attachment points for radio, hand gun, admin, or gun-shot wound pouches. With plenty of webbing on the shoulders and waist the rig can be worn high on the chest or low around the waist. X or H harness configuration is available and multiple color options – Multicam, A-TACS AU, A-TACS FG, Coyote, Ranger Green, OD, Khaki, SURPAT and Black. 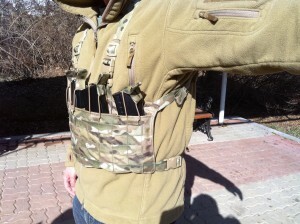 This AK chest rig is an (unconventional warfare) UW chest rig perfect for light fighters. It is simple, robust, effective and designed for the weapon system it supports. 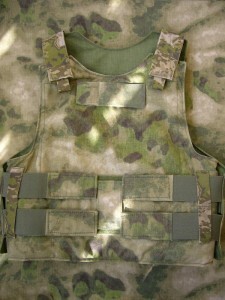 The 5 mag SVD chest rig was designed to be low profile and lighten the load for the operator. The rig has 5 mag pockets that incorporate the unique Hybrid elastic/snap retention system. The SVD chest rig is available in Multicam, A-TACS AU/FG, Coyote, Ranger Green, OD, SURPAT, Khaki and Black. Thanks to one Angry Man that helped with the design. 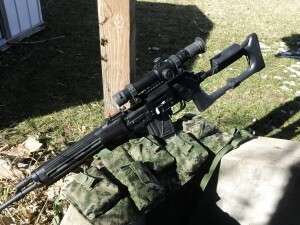 These are great pics of a PSL with the Black Horse Arsenal Stock.